Discover the Benefits of Doodling! Educator and internationally known sketchnoter Sylvia Duckworth makes ideas memorable and shareable with her simple yet powerful drawings. In How to Sketchnote, she explains how you can use sketchnoting in the classroom and that you don’t have to be an artist to discover the benefits of doodling! Sketchnoting (aka visual note-taking) allows students to see the bigger picture in the concepts they are studying, make connections in their learning, and display their learning process—and all of that leads to better retention. 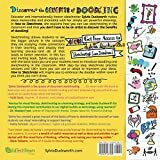 In this fun and inviting book, Sylvia equips you with the basic tools you and your students need to introduce doodling and sketchnoting in the classroom. With step-by-step sketchnote practice sessions and 180+ icons you can use or adapt to represent your ideas, How to Sketchnote will inspire you to embrace the doodler within—even if you think you can’t draw.